Yom Ha'Atzmaut, Israel Independence Day, is preceded by several days of remembrance in the Jewish calendar - Holocaust Remembrance Day, Tzfat Day (commemorating the liberation of Tzfat during the 1948 War of Independence) and Memorial Day for Fallen Soldiers. So it almost comes as a bit of a surprise when, at the moment that the siren for Memorial Day sounds to end that day, celebrations break out to usher in Yom HaAtzmaut, Israel Independence Day. The fireworks begin, the music blares, and Tzfat explodes in lights and excitement as residents stream to the center of town from all neighborhoods to celebrate together. Colored lights are strung throughout the main street of the town - no matter how far the new neighborhoods are from the center of town, everyone is drawn to the main street for the major festivities. By sunset, youngsters start patrolling Jerusalem Street, Tzfat's "main drag" with cans of silly string, which they spray on anyone who crosses their path, and when night falls, these kids are racing around the street covered in foam of many colors. 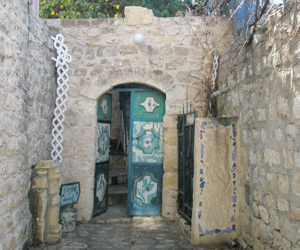 The central stage of Tzfat's Independence Day gala is generally set up outside, next to the historic Saraya building. The city does this for practical purposes.....it's the area with the most open space in the vicinity of Jerusalem Street. But there's also a bit of poetic justice in seeing Israelis celebrating their independence at the site of the government headquarters of both the Turkish and the British governors, both of whom represented occupying powers which tried to thwart the Jewish dream of an independent Jewish country. The stages have performances by Tzfat's youth clubs' dancing and singing groups. Almost everyone has a child or neighbor who is performing, so for the first few hours, most merrymakers can be found in this vicinity. Then, after the 10:00p.m. fireworks, the main performance begins as a well-known performer who has been invited to Tzfat for the evening commences his or her evening performance. Various social groups of elderly citizens stake out their corners of the town and watch, bemusedly, as the festivities get underway. One "performance" which is mandatory is the mayor's speech. Every mayor in recent memory has tried to speak, and only those with exceptionally strong amplifying systems have succeeded, but there's plenty of politics as representatives of the various political parties and interest groups work the crowds, promoting their particular stand or belief. Recent years have seen a proliferation of ecological and environmental activists out and about at the Yom HaAtzmaut celebrations - a sign that, even in Tzfat, times change, often for the better.